Variety hispidus is very local in the southernmost Lower Peninsula, from Monroe Co. to Kalamazoo Co.; it grows in moist to dry upland places (oak forests, sandy knolls, etc.). 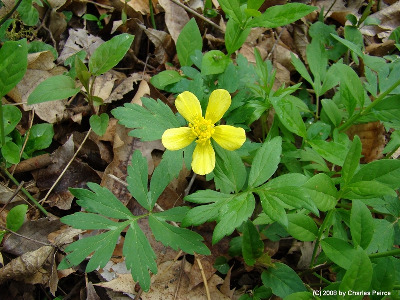 The other two, more widespread varieties have practically the same habitats and may indeed grow together; they are characteristic of wet areas in forests and thickets along streams, ponds, and lakes, as well as ravines and in deciduous or cedar swamps. (a) Variety hispidus barely enters southernmost Michigan and is a small erect plant, not producing trailing shoots; the petals are less than 1 cm long and the achenes are only narrowly margined. (b) Variety caricetorum (Greene) T. Duncan occurs throughout the state and is a large coarse often very pubescent plant (with twice the chromosomes of the other varieties), producing trailing shoots which often root (and which can be seen developing from the base of the plant early in the season); the flowers are the largest in this variety, the petals usually over 1 cm long and sometimes nearly 2 cm. (c) Variety nitidus (Elliott) T. Duncan, found in the southern half or two-thirds of the Lower Peninsula, somewhat similar to var. hispidus in small stature and often confused with it, but characteristic of moist habitats and with trailing shoots, as in var. caricetorum, from which it differs in more broadly winged achenes, petals seldom much over 1 cm long, and often less pubescence. Ranunculus septentrionalis Poir. is a name widely used for var. caricetorum but actually applying to var. nitidus. MICHIGAN FLORA ONLINE. A. A. Reznicek, E. G. Voss, & B. S. Walters. February 2011. University of Michigan. Web. 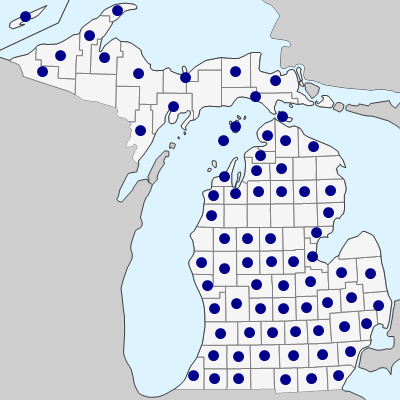 April 21, 2019. https://michiganflora.net/species.aspx?id=2391.